Literature scholars participate in a larger shared community of knowledge through their research and analyses of literary texts. Research in the fields of rhetoric and genres studies has identified a number of characteristic motivations that are shared within this community or field. In this section, we will consider five of these motivations, the last two being particularly relevant to the field of Canadian literature (Banting). Table 1. Characteristic Motivations in Literature Scholars’ Writing. Short list adapted from Fahnestock and Secor; Wilder; Linkon; Banting. Despite being widely shared by literature scholars, these motivations are almost never explicitly declared in our classroom discussions (Wilder and Wolfe 173) or in the work of professional scholars. Indeed, researchers have found that instructors generally implicitly expect their students to adopt these shared motivations without guidance (Wilder and Wolfe; Wilder 63, 93). Emergent scholars in the field, including students, are left to gradually absorb the motivations intuitively and subconsciously, by listening to how their instructors and peers quietly guide discussion and establish goals for essay writing. In this chapter, we take the rare chance to discuss these motivations explicitly which may allow you to absorb them more quickly and eventually to work against them knowledgably, if you choose. Perhaps you have already begun to write essays that adopt some of them! We begin with a scholar named Florence Stratton, whose article interweaves at least three of the motivations listed in Table 1. In this section, we will discuss an excerpt in which Stratton introduces the background motivations for her argument about Green Grass, Running Water. Although she doesn’t say so explicitly, Stratton is explaining why she finds it so important—so motivating—to pay attention to how Indigenous texts critique colonial ideas: in her view, previous scholarship has overlooked these texts and such critique, and she is now claiming an ethical imperative to pay attention to them. Remember, we can understand such motivation as public, a signal of the values and issues within this field of scholarship. Stratton begins to respectfully summarize Huggan’s previous argument. She critiques his decision, arguing that he takes a biased European-Canadian perspective. Then she introduces what she will do in response: take an original perspective. Florence Stratton by Gail Chin. Reproduced with permission from Gail Chin. Stratton explains that her argument will correct “omissions or exclusions” in Huggan’s discussion of maps. She treats Huggan with respect, calling his work “substantial,” but thinks he was mistaken to omit Indigenous texts. Her essay will say something original by adding Indigenous texts to the picture. Notice that we could also see Stratton as working, here, to introduce overlooked texts to the field. Notice, too, that Stratton critiques what she sees as Eurocentrism—or, at least, insensitivity—in European Canadian culture. European Canadians see their culture as the victim rather than the perpetrator of colonialism, she says. This self-centered viewpoint “discounts First Nations experience.” Stratton wants to correct that insensitive discounting, because she is motivated to detect, identify, and critique ethical problems in others’ ideas. Stratton’s own positioning of herself as somehow more aware or having transcended such ethical problems in scholarship and culture is significant here. The motivations she uses reveal the issues and anxieties around settler and First Nations relations within the field of Canadian literature scholarship at the time, and Stratton works to position herself appropriately. In this next excerpt, a scholar named Marlene Goldman is, like Stratton, interested in how the novel Green Grass, Running Water maps the world. In Goldman’s view, the novel uses verbal maps to critique and revise a Western worldview (that is, a view of the world derived from European culture) and replace it with an Indigenous worldview. Goldman’s article will focus on detailing at length the Indigenous cultural traditions that the novel draws on, explaining how it is important to understand those traditions to make sense of the novel’s worldview. Goldman’s article exemplifies the context motivation: she thinks it’s important to read the novel as having its own Indigenous cultural context and perspective rather than to read it from a Western cultural perspective. Indeed, she’s interested in how King’s novel challenges Western culture itself. Goldman positions King as having a particular cultural background. Table 3. Motivations in Marlene Goldman’s Article. 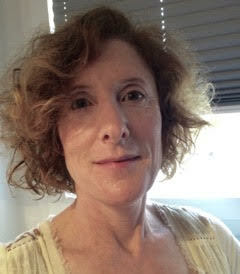 Marlene Goldman. Reproduced with permission from Marlene Goldman. Here, Goldman deliberately points out King’s multi-layered “Cherokee/Greek/German” cultural position to help contextualize what she perceives as the novel’s “Native worldview.” She reads the novel as purposefully working against a “Western worldview’s” systems of mapping. Her study is focused, she says, on the novel’s “interrogation”—its challenging and questioning—of those systems. Our final excerpt is from an article by a scholar named Herb Wyile. Wyile’s article emphasizes a strategy of reading which he thinks is necessary for approaching novels like Green Grass, Running Water—novels that mix cultural traditions and that critique and undercut, or subvert, colonial stereotypes. Among other things, Wyile argues that this reading strategy requires “self-consciousness about one’s assumptions.” In the excerpt, he is explaining why such a careful, self-conscious strategy is necessary as the novel mixes so many different elements that—unless you are cautious enough to resist your first assumptions—you may not interpret it appropriately. We can see Wyile’s complexity motivation in his interest in King’s challengingly “heterogeneous”—mixed and diverse—writing, and in his commitment to describing at length the many layers of King’s writing. The need for careful qualification and for self-consciousness about one’s assumptions is particularly evident in attempting to describe the heterogeneous formal qualities of King’s writing. His work . . . makes use of techniques of verisimilitude, reversals of fortune, mistaken assumptions, romantic entanglement, and so on, that are familiar to readers grounded in the Western comic tradition. Yet King also echoes stories from various Native traditions (Iroquois, Seneca, Cherokee, Blackfoot); he consistently draws on traditional forms of oral stories such as creation stories, cycle stories, and trickster tales; and he makes use of discursive conventions from oral storytelling, such as digression, repetition, a more informal and less elaborate syntax, and narratorial interaction with the audience. Finally, evident in his last two books is a parodic touch—an irreverent, subversive representation of dominant figures and narratives out of Western literature, religion and history—which has affinities with certain kinds of postcolonial texts which rewrite the canonical texts of the colonial centre . . . .
Wyile points out the need to be cautious when analyzing King’s writing, because it is so heterogeneous. He lists storytelling techniques King uses that are familiar parts of Western literary culture. Now he adds a list of story forms King uses that come from various Indigenous cultural traditions. He adds that King also uses parody, as do other kinds of postcolonial text. Here Wyile comments that it would be tempting to call King’s writing a “blend” of different cultural elements. But he argues that it would be more appropriate to call it a “complex,” as Anishinaabe scholar Kimberly Blaeser has done. Table 4. Motivations in Herb Wyile’s Article. 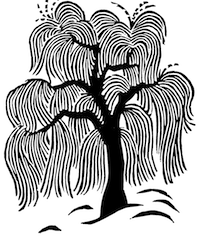 In his second paragraph, Wyile says some people might be tempted to make a simple statement about King’s work—“to describe [it] as blending Western literary forms with forms from Native cultures.” But Wyile resists that temptation, obeying instead what he calls the “more appropriate” impulse—an impulse towards complexity. He uses the terms of another scholar, Blaeser, to characterize King’s work as “a complex.” In this way, Wyile’s efforts here are also clearly driven by the ethics and context motivations. “Trust Tonto” by Herb Wyile. Issue 161/162 of Canadian Literature. Canadian Literature. As we discussed in the Stratton example, Wylie’s own self-positioning is important in using this motivation; he positions himself as attempting to overcome the limits of a simple culturally-blunt reading, and invokes the work of an Anishinaabe scholar to develop his position, motivated by an ethics of inclusion and the desire not to reduce the work to a simple cultural opposition. Reflect on the set of scholarly motivations explained in this section. Why might these motivations have become so important to scholars? Considering the examples in this chapter, consider how cultural context shapes the values and issues within literature scholarship and so might inform the shared motivations for writing. Can you think of other motivations for engaging literature that are not included in this list? The excerpt below is from the introduction to a 2015 article on Green Grass, Running Water by literature scholar Joel Deshaye. Deshaye’s article analyzes how the genre of the Western is used in the novel and in other Canadian texts. Deshaye considers how King’s use of the iconic pop-culture figure of John Wayne challenges our understanding of the “Western” in Canadian culture. He also considers how King’s writing critiques the pop-cultural representation of Indigenous people in North America.Take your time reading carefully through this excerpt, and decide whether Deshaye invokes any of the five characteristic motivations of his scholarly community. If so, how can you tell? Also consider whether you detect any additional motivations implicitly driving Deshaye’s interest in King’s writing. I argue […] that King’s vision of John Wayne reframes other Canadian Westerns […] as a collective fantasy of the death of American celebrity—or at least as an attempted subversion of American pop-cultural influence. In Green Grass, Running Water and other later texts, King articulates his stake in a popular culture that has a pernicious influence on opinions of the First Nations and Native Americans. As King suggests, the problem is that figures such as Wayne spin off out of popular culture into history, or at least into popular conceptions of history, and give the false impression that modern Indigenous culture is an oxymoron; it was supposed to have died in the nineteenth century. Here, Deshaye outlines one point he will make in this essay: he will argue that King’s representation of Wayne allows us to see other Canadian Westerns as subverting (or fantasizing about putting an end to) the influence of American pop culture on Canadian culture. Then, Deshaye introduces another point he will make: he will argue that King uses his writing to intervene in popular opinions about Indigenous peoples in North America. Here, Deshaye sets his own study in context of previous scholarly essays written about the same novel, commenting that no one has focused on King’s use of the Western or John Wayne. …and because such a striking number of Canadian Westerns have by now been published. Table 5. Motivations in Joel Deshaye’s article. Banting, Sarah. “If What We Do Matters: Motives of Research in Canadian Literature Scholarship.” English Studies in Canada 42.3-4 (2016): 27-64. Print. Deshaye, Joel. “Tom King’s John Wayne: The Western in Green Grass, Running Water.” Canadian Literature 225 (2015): 66-80. Print. Fahnestock, Jeanne, and Marie Secor. “The Rhetoric of Literary Criticism.” Textual Dynamics of the Professions: Historical and Contemporary Studies of Writing in Professional Communities. Ed. Charles Bazerman and James Paradis. Madison: U of Wisconsin P, 1991. 76-96. Print. Goldman, Marlene. “Mapping and Dreaming: Native Resistance in Green Grass, Running Water.” Canadian Literature 161-62 (1999): 18-41. Print. Linkon, Sherry Lee. Literary Learning: Teaching the English Major. Bloomington: Indiana UP, 2011. Print. Stratton, Florence. “Cartographic Lessons: Susanna Moodie’s Roughing It in the Bush and Thomas King’s Green Grass, Running Water.” Canadian Literature 161-62 (1999): 82-102. Print. Wilder, Laura. Rhetorical Strategies and Genre Conventions in Literary Studies: Teaching and Writing in the Disciplines. Carbondale: Southern Illinois UP, 2012. Print. Wilder, Laura, and Joanna Wolfe. “Sharing the Tacit Rhetorical Knowledge of the Literary Scholar: The Effect of Making Disciplinary Conventions Explicit in Undergraduate Literature Courses.” Research in the Teaching of English 44.2 (2009): 170-209. Print. Wyile, Herb. 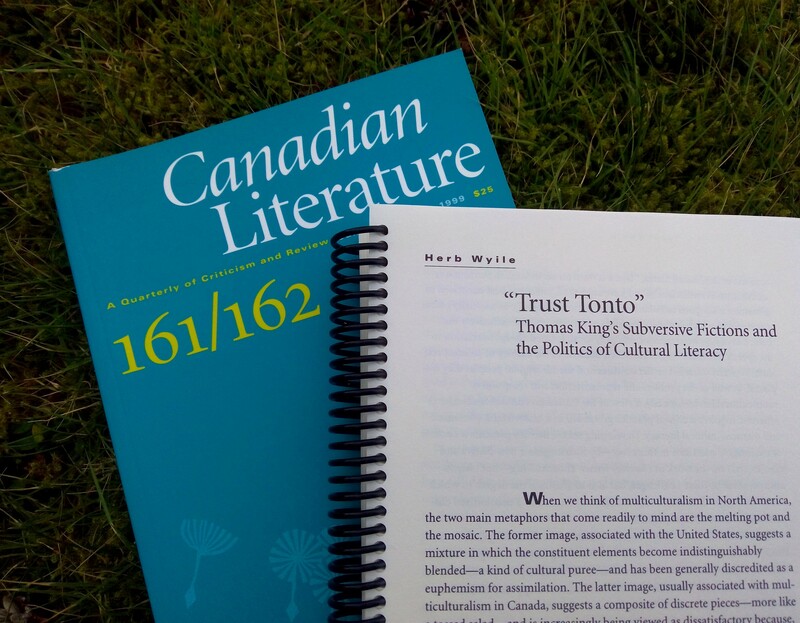 “‘Trust Tonto’: Thomas King’s Subversive Fictions and the Politics of Cultural Literacy.” Canadian Literature 161-62 (1999): 105-24. Print.